Garlic is well-known for it’s strong antibiotic properties. Useful in treating colds, flus, sore throats, and poor digestion, garlic is also antiseptic, antimicrobial, and antibacterial. As you probably know, garlic appears in many home remedies. It is one of the essential ingredients to have on hand when creating your natural home pharmacy. I especially enjoy using garlic to make a garlic poultice which is helpful in administering garlic to those who can’t stand the flavor or have an upset stomach and can’t swallow much of anything. It’s also a superstar in this garlic-honey syrup, which helps fight infection. 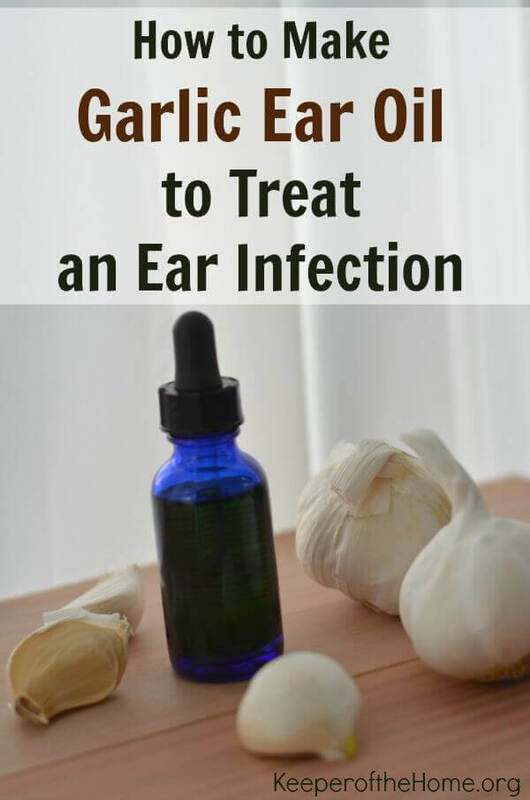 Another place garlic shines is in treating ear infections. In fact, studies have shown that using garlic oil is just as effective at treating ear infections as antibiotics … but without the side effects (which include demolishing healthy gut bacteria). That said, it’s difficult to just tough it out when dealing with the pain associated with ear infections. 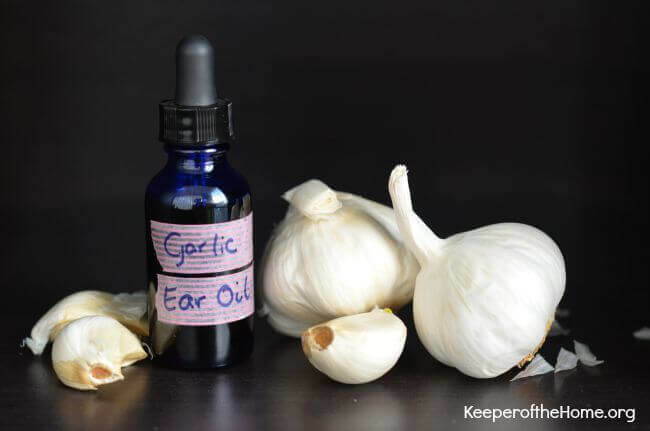 Thankfully there is a way to minimize pain and speed healing of ear infections, without using antibiotics: garlic ear oil! The following garlic ear oil is especially useful in treating ear infections caused by colds and respiratory congestion. It should not be used to treat swimmers’ ear or if you suspect a burst eardrum. The pairing of garlic and olive oil is a perfect match; the garlic fights infection while the warm oil soothes and eases pain. You will also need a strainer, cheesecloth, canning jar or bowl, dropper bottle, and double boiler. 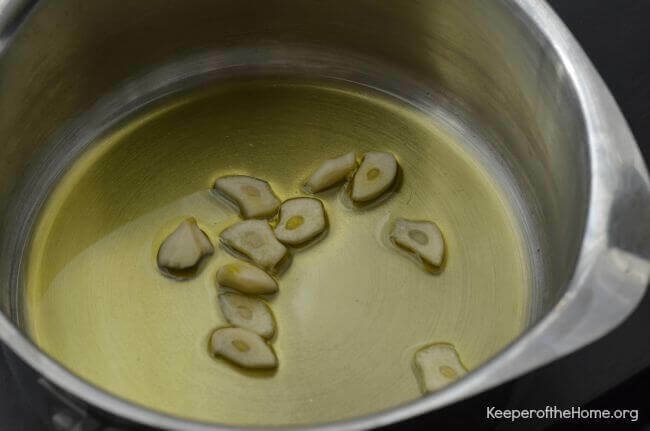 Place garlic and oil in the top of a double-boiler. Warm over low heat for approximately 10 to 15 minutes. 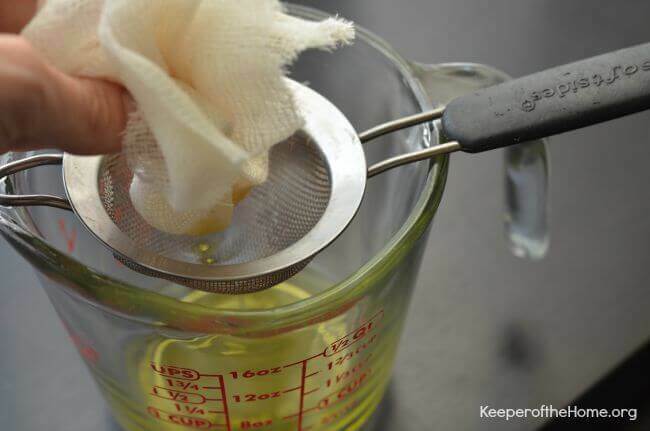 Place a mesh strainer over a bowl, heavy glass measuring cup, or canning jar. Lay a piece of cheesecloth in the top of the strainer. 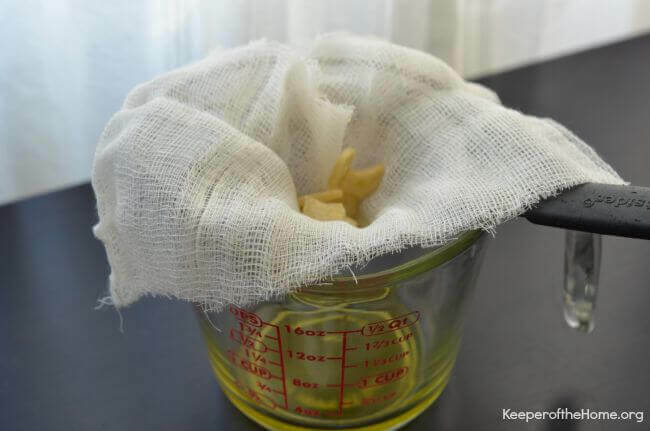 Pour oil through the cheesecloth/strainer. Be sure there are no pieces of garlic left in the oil, no matter how small. Pour the strained oil into a dropper bottle. Label and store in a cool, dark place. It can be kept in the fridge if a cool, dark place is not available. Garlic ear oil must be warmed before each use. To warm place the dropper bottle into a pan of warm water. Leave there until the oil is warm (the temperature of breastmilk), but not hot. You may want to test the oil on the underside of your wrist to make sure it is not too hot. Have patient lay on their side with the affected ear facing up toward the ceiling. If using on a child, place 3-5 drops of garlic ear oil in the ear. Adults can use more, even up to 1/4 teaspoon or one dropperful (as recommended in Rosemary Gladstar’s Medicinal Herbs). Hold a warm, dry cloth or hot water bottle over the ear for 5-10 minutes. Repeat in the other ear, if possible. This process can be repeated three times a day. If garlic oil cannot be placed in the ear for some reason, try rubbing the oil alongside the outside on the neck near the eustachian tubes. Warning: Garlic oil should not be used to treat swimmers’ ear or if you suspect a burst eardrum. Have you used garlic ear oil to treat ear infections? Was it effective? Hi Stacey, Thank you for this post. I clicked on your link to the Garlic-Honey Syrup, but received an error message saying that post could not be found. Could you share that recipe with me? Thanks! Yes! We tried it last year for the first time in an effort to avoid more antibiotics. It worked! And pained was relieved with a minute.